ski~mojo, the spring loaded support system that helps reduce pain and fatigue for skiers, has forged partnerships with two snowsports instructor organisations, BASI (British Association of Snowsports Instructors) and PSIA-AASI (Professional Ski Instructors of America – American Association of Snowboard Instructors). 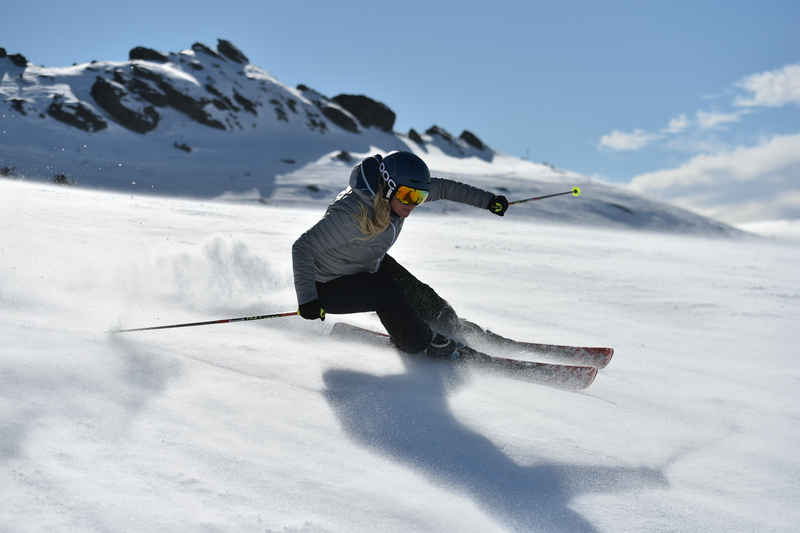 As more instructors have seen the benefits of using a ski~mojo during their season, both organisations understood the benefits of making them officially available to their members. Members of both organisations will get a 30% discount on the recommended retail price when purchased directly from skimojo.com. Specially developed using medical insights in Great Britain, ski~mojo is a device that uses spring recoil technology to take up to a third of the strain off the legs and knees by providing kinetic energy to assist leg extension. 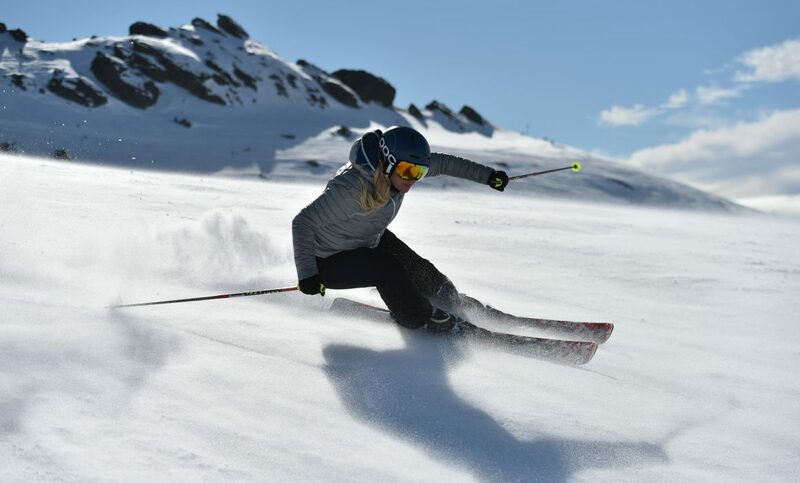 ski~mojo supplements the power of the leg muscles, this in turn reduces impact, substantially delays muscle fatigue and alleviates leg and knee pain. The ski~mojo works like an exoskeleton for the legs consisting of a lightweight comfortable harness with neoprene knee supports containing powerful springs. Worn under ski pants the ski~mojo is totally discreet so no-one would know it is being worn. For anyone heading out on a ski holiday this winter and has been wondering about how the Ski-Mojo might help them with their skiing, they can now try it in several French ski resorts across the Alps and Pyrenees. Official ‘Mojo Masters’ are available to provide fitting and guidance in resort and will ski with anyone testing the product for up to 45 minutes. The Mojo Masters are all competent skiers who know the area well and can take testers to the most appropriate terrain so they get a feel for the product. “The Ski-Mojo is a fantastic product for helping anyone to ski longer and I’m really looking forward to working with it this winter and helping skiers test it out on the slopes of Les Saisies“. Some of the resorts currently available for testing including, Espace Killy, Les Arcs, La Plagne, Courchevel, La Clusaz, Les Saisies, Serre Chevalier, Megève, Gourette, Andorra and La Mongie – more resorts will be available later in the winter. 1 day, 50€; 2 days, 70€, 3 days, 90€; 4 days, 110€; 5 days, 120€; 6 days, 130€. The Ski-Mojo devices are available to test for a minimum of half a day and up to a full day if required. Mojo Masters will help to fit any tester and remain with them for up to 45 minutes. A full deposit of 560€ might be required to test the Ski-Mojo. If a purchase of the Ski-Mojo is made after the test then there’s no extra charge for the test or the Mojo Master’s time – if no purchased is made, a 50€ charge for the day’s rental will be charged. If a tester is renting the Ski-Mojo for more than one day then a 50€ purchase of the neoprene support is required. The new easy to fit ski~mojo is now available ahead of schedule. The performance of the ski~mojo is unchanged – but the initial set-up is far easier and quicker. New Boot attachments and quick set telescopic rods mean the initial fitting can be done in 2 minutes. Are you a Snowhead? If so, grab the chance to try out a ski~mojo at the Snowheads OktoberTest South this weekend (Saturday October 8th) at The Snow Centre, Hemel Hempstead. Snowheads are holding their annual OctoberTest weekend and on Saturday at The Snow Centre, Hemel Hempstead, any ‘Snowhead’ who would like to try out the ski~mojo can do so free of charge without any obligation to make a purchase. You’ll also get the chance to try out a number of different skis, meet with like-minded people and have some fun before the winter season starts kicking off in full. We are bringing along lots of ski-mojo’s for people to try, whether they have knee and joint issues or whether they simply want to give them a go because are intrigued. It’s a great opportunity to try before you buy if that’s what you’re considering or indeed understand what a powerful effect ski~mojo’s can have on your skiing, even inside a snowdome. Snowheads OktoberTest South: 17:00 to 21:00 on Sat 08 Oct 2016, The Snow Centre, Hemel Hempstead. Available to purchase worldwide at skimojo.com/buy. Ski-instructor, and ex-British Ski Team member, Ashley Kay of First Tracks Ski Coaching Courchevel gives his opinion of Ski~Mojo. The Ski~Mojo was reviewed by the Examiner.com website. 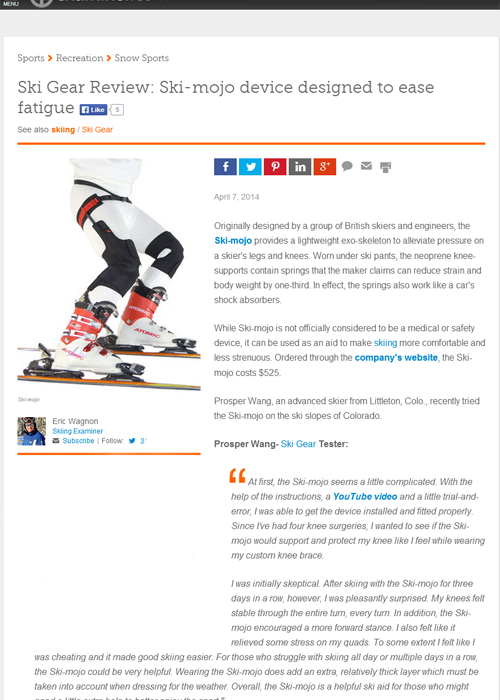 The article was entitled: Ski Gear Review: Ski-mojo device designed to ease fatigue. Link to press release on the Ski Press website. 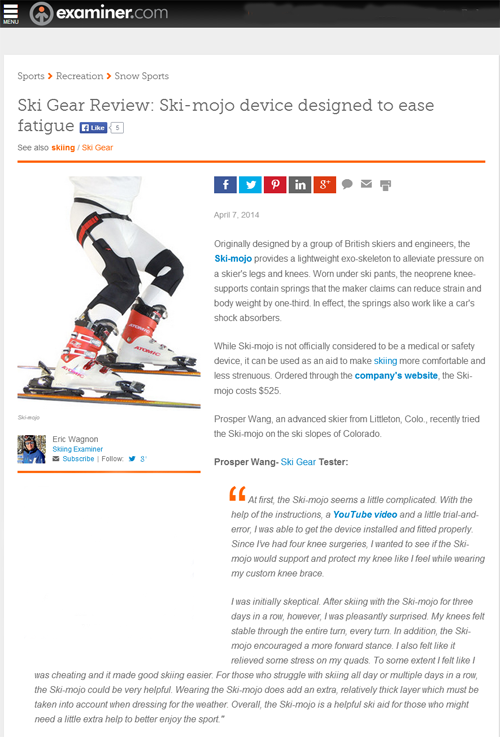 Back in December 2013, the Ski~Mojo was featured in this report from CNN Worldsport Alpine Edge. It was filmed in Val D’Isere before the World Cup. Ski~Mojo mention 2 minutes and 6 seconds in.